The ABI Veriti 384-Well Thermal Cycler is a dependable system, ideal for research related applications. 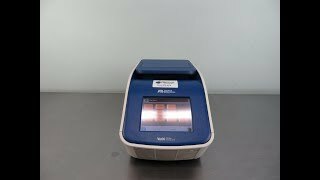 The Veriti 384-Well PCR comes with the Veriflex temperature control system that leverages six independent temperature blocks to deliver accurate control, and multiple temperatures to allow the user to completely optimize their PCR runs. The Applied Biosystems Veriti 384-Well Thermal Cycler includes a digital touch screen controller, is responsive with a convenient touch screen interface to guide users through set up, and viewing temperature profiles. The PCR Machine comes with a standard 0.2ml block and works with most PCR tubes. Up to 12 ABI Veriti can be networked for a high throughput option, controlled from a single machine on the ABI Veriti Thermal Cycler. With the incorporation of the optional Veriti Link labs can grow even further by remotely controlling up to 50 thermal cyclers from a controlling PC or smartphone. Users of the ABI Veriti 384-Well Thermal Cycler can choose from predefined protocols, or for the best in flexibility users can edit their own methods, with program overwrite protection to avoid accidental tampering. You can either save the methods on the thermal cycler system or to a memory stick for transfer to other non-networked machines. In the event of a power failure, this PCR system will automatically restart. The ABI Veriti 384 has been tested multiple times and is in excellent working condition. All of our lab equipment comes backed with our standard warranty. Should you have any questions, please don't hesitate to contact us.